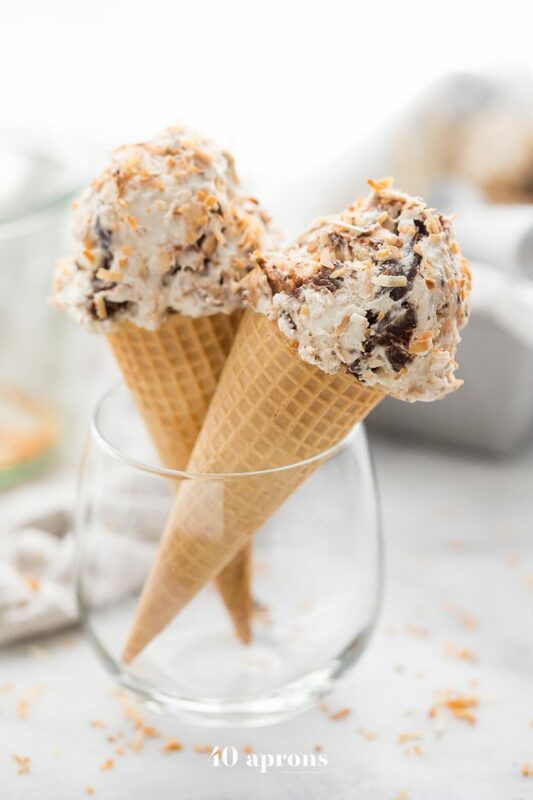 This Samoas cookies ice cream recipe is a homemade and healthy take on the Girl Scout cookie favorite! 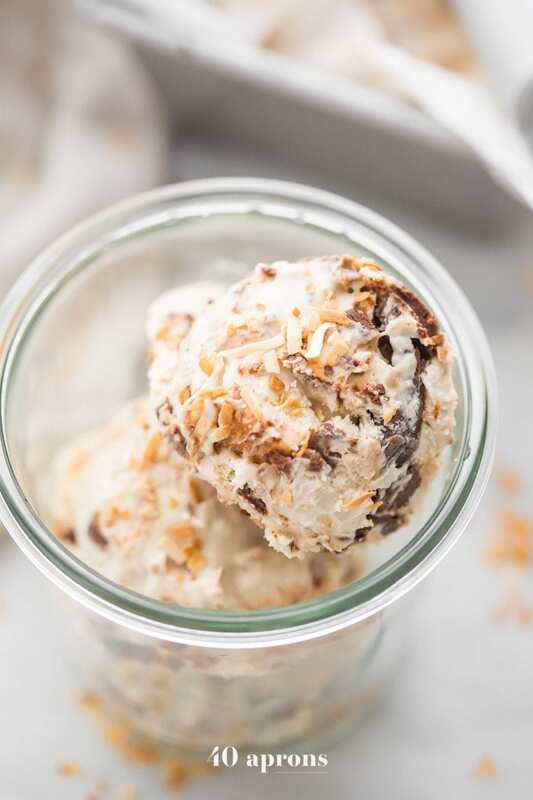 Paleo and vegan, this frozen treat includes a super creamy caramel ice cream, lots of toasted coconut, quick and easy homemade shortbread cookie crumbles, and a rich fudge layer. It’s surprisingly easy to make, too! Usually I can hold off during Girl Scout Cookie season, but this year I just had way too many friends’ kids looking at me with their little Bambi eyes, begging me to fill out their order sheets with a resounding “14” in the Samoas column. And being pregnant? I kind of have this semi excuse + loco amount of stress prepping for maternity leave that, together, result in way too many moments alone on the couch with an open box and the cellophane positively torn off. It’s on, Samoas. The shortbread stays crunchy but not too crispy. 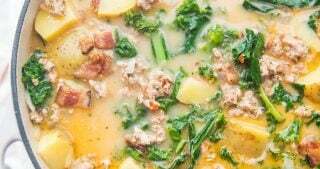 It’s easy to throw together and is the perfect texture, even after weeks in the freezer! The caramel is made in the microwave, meaning it’s insanely easy and surprisingly delicious. 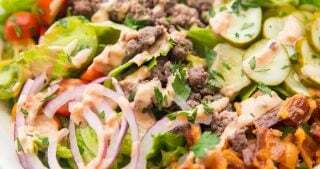 Vegan and paleo, too! The Samoas cookies ice cream base is made entirely in the blender, making it just as easy as the caramel to make. The resulting Samoas cookies ice cream is everything you could ever want from such a thing. Each element stands out on its own beautifully, and, together, they sing in perfect harmony. Just like Samoas cookies! But refreshing, creamy ice cream form. Perfection. Make your caramel: combine all caramel ingredients in a small to medium microwave-safe bowl (I use a soup bowl). Microwave on high 1 minute, then stir. Microwave 2 minutes, stir. Microwave 1 minute, stir. Microwave 1 more minute, stir. Done! If at any point your caramel is looking thickened, you can finish microwaving at that point. It takes that 1-2-1-1 process to produce the best caramel in my microwave. Let caramel cool completely. 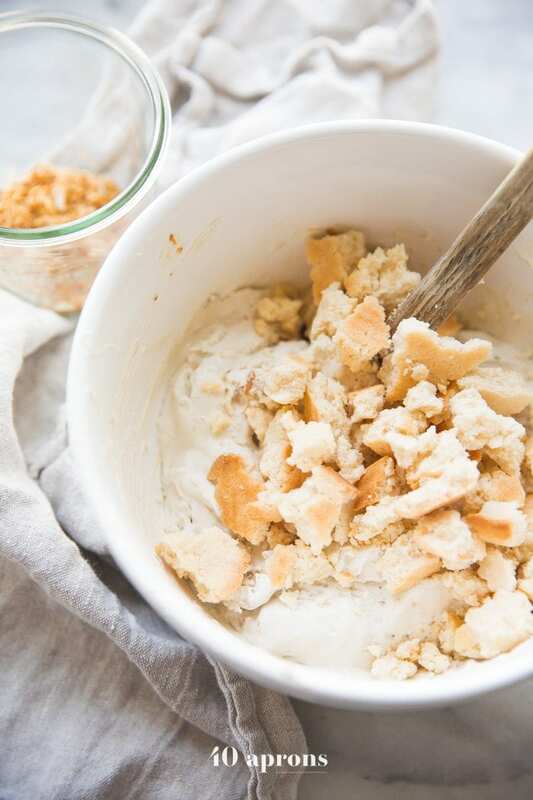 Make your shortbread: stir together all ingredients and press into a parchment-lined loaf pan. Bake at 325º F for 15 minutes or until edges are turning golden brown. Remove from oven and let cool slightly, then crumble into bite-sized pieces. Return to oven and bake another 10 minutes. 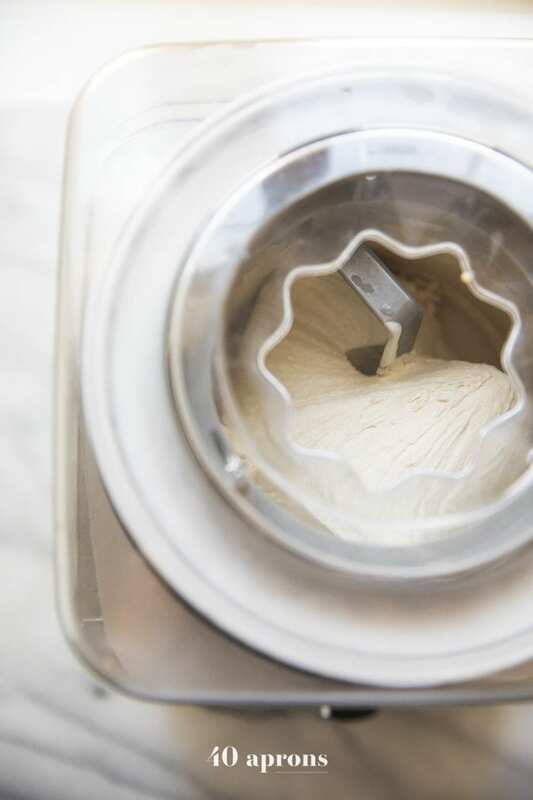 Make your ice cream base: blend all ingredients together in a high-speed blender until very smooth. Stir in cool caramel sauce and chill completely. Once chilled, freeze in an ice cream maker according to manufacturer’s directions. Make your fudge layer: place chocolate chips in a medium microwave-safe bowl. Microwave 1 minute then stir very well. Continue microwaving in 30-second bursts, stirring completely between bursts, until chocolate is melted. Stir in coconut cream until melted and smooth. 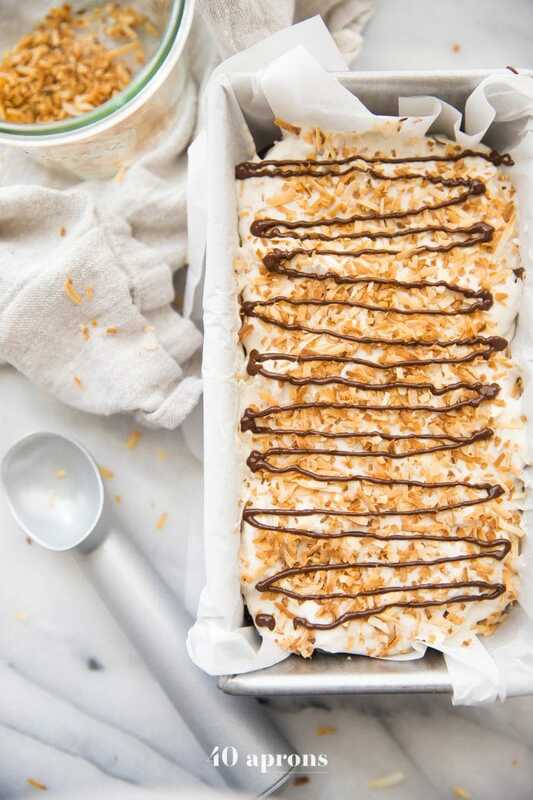 If your fudge looks a bit grainy, that’s OK.
Toast your coconut: add coconut to a skillet and, over low to medium-low heat, toast until golden brown on both sides, stirring frequently. Transfer to a bowl. When your ice cream in the maker has the consistency of soft serve, remove from maker and transfer to a large bowl. 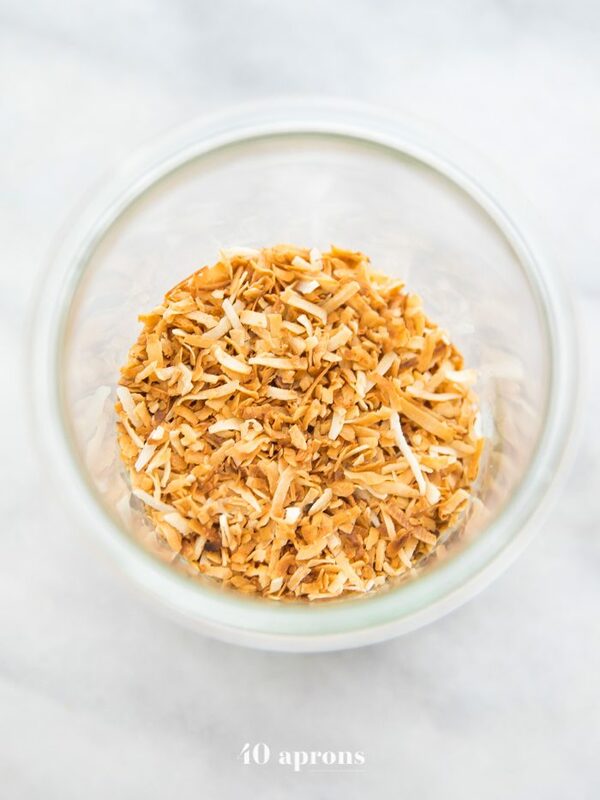 Stir in coconut, reserving 2 tablespoons for garnish. 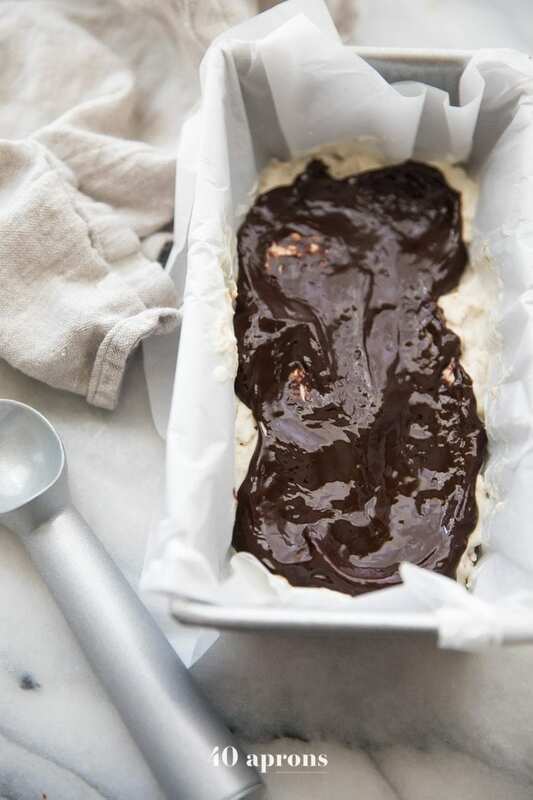 Spoon half into a loaf pan then top with all the fudge layer, reserving 2 tablespoons for garnish. Smooth fudge layer evenly over bottom layer of ice cream. 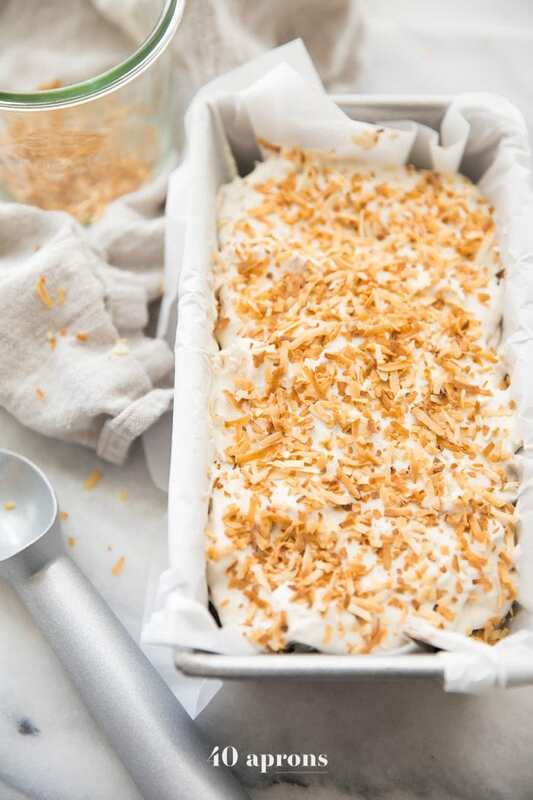 Top with the remaining ice cream, then garnish with reserved toasted coconut. 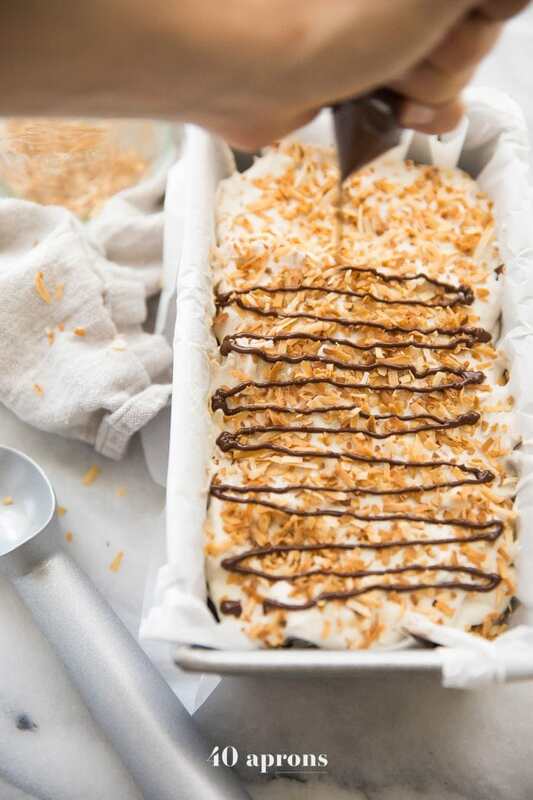 Transfer reserved fudge layer to a small plastic bag, snip off the end, and drizzle on top of toasted coconut garnish. Transfer to freezer and let freeze until hard, about 4 hours. Boil the caramel ingredients on the stovetop if you don’t use or have a microwave. You’ll want to boil it until you notice the mixture thickening; this will probably take about 5 minutes. My 5-Minute Paleo Caramel Sauce recipe would be a great substitute. Make the fudge layer in a double boiler if you don’t want to use the microwave: bring 1-2 inches of water to a boil in a saucepan with another pan or heat-proof bowl fitted on top. Add the fudge layer ingredients and stir, whisking regularly, until melted and smooth. 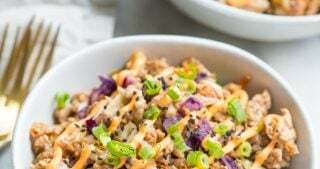 Add walnut pieces for some extra crunch! 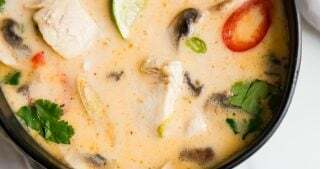 Simply replace the 1 cup cashews with 1 cup coconut cream (Just the solid water part of a can of coconut milk or coconut cream). It won’t be quite as creamy but it should work and taste good! Continue on with the rest of the Samoas cookies ice cream recipe as written. 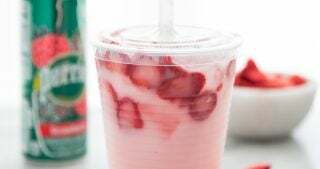 Can I make this if I don’t have a high-speed blender? Yes, girl! 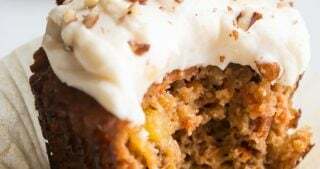 While I recommend everyone invest in a Vitamix high-speed blender, you can make this Samoas cookies ice cream recipe in a regular blender, too. 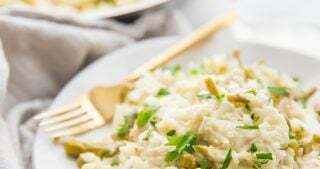 Make sure you soak your cashews in hot water for 4-6 hours (Simply cover them with hot water then let them soak for 4-6 hours – no need to keep the water hot) then make the recipe as written. If your mixture isn’t perfectly smooth, you can sieve it with a fine mesh sieve or nut milk bag. 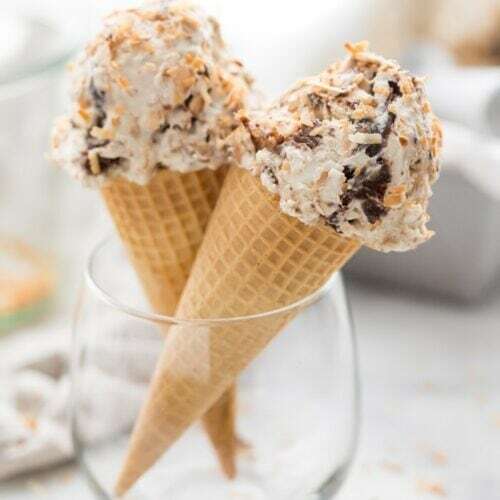 Can I make this Samoas cookies ice cream recipe if I don’t have an ice cream maker? You can… but it will require more hands-on work. I highly recommend investing in an ice cream maker, since it’s so easy to make homemade ice cream. 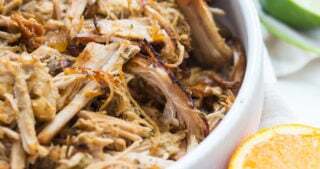 And you can be so deliberate about flavors and the ingredients that are (or aren’t!) in your treats. I’ve used David Lebovitz’s technique multiple times with great results. Try that instead… and consider getting an ice cream maker anyway! You’ll want to make this Samoas cookies ice cream recipe all the time anyway. 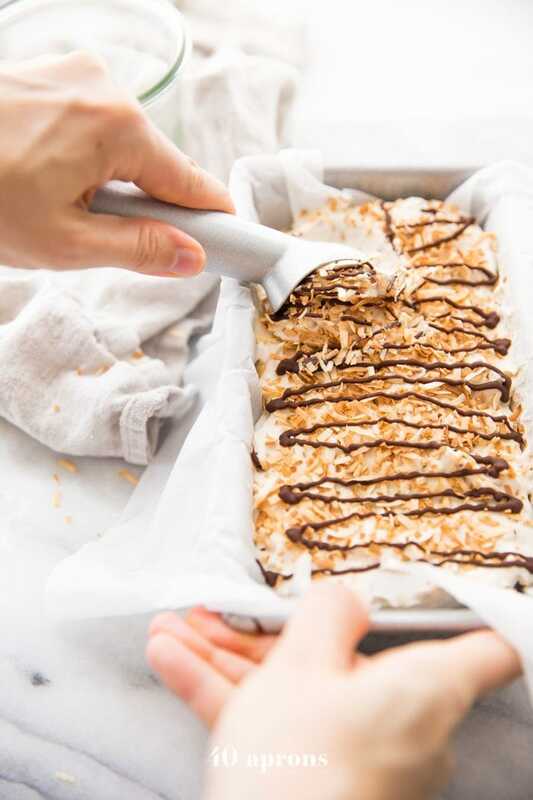 A healthy summer treat recipe inspired by Samoas cookies, the Girl Scout Cookie favorite. 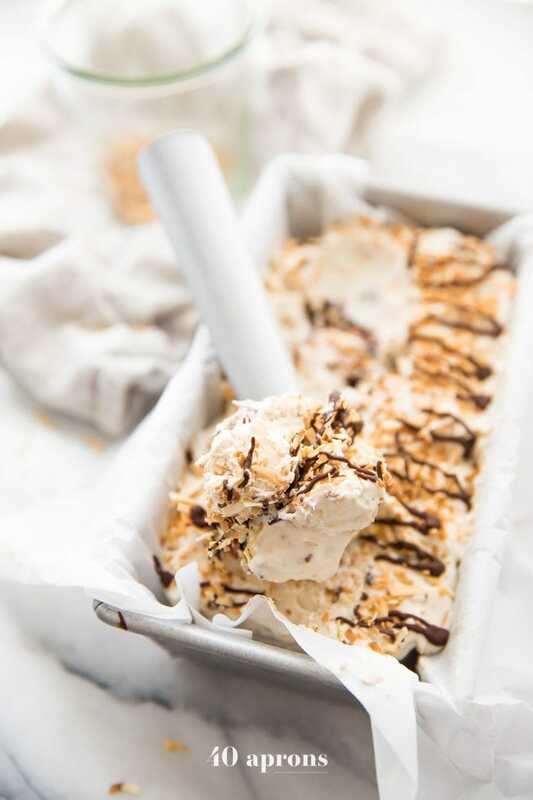 Paleo and vegan with a creamy caramel ice cream base, lots of toasted coconut, crunchy shortbread cookie pieces, and a rich fudge layer, this healthy ice cream is actually super easy to make! Makes about 5-6 cups. Combine all caramel ingredients in a small to medium microwave-safe bowl (I use a soup bowl). Microwave on high 1 minute, then stir. Microwave 2 minutes, stir. Microwave 1 minute, stir. Microwave 1 more minute, stir. Done! If at any point your caramel is looking thickened, you can finish microwaving at that point. It takes that 1-2-1-1 process to produce the best caramel in my microwave. Let caramel cool completely. Stir together all ingredients and press into a parchment-lined loaf pan. Bake at 325º F for 15 minutes or until edges are turning golden brown. Remove from oven and let cool slightly, then crumble into bite-sized pieces. Return to oven and bake another 10 minutes. 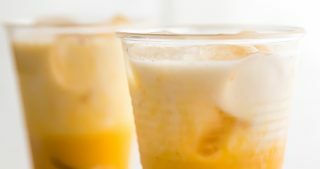 Blend all ingredients together in a high-speed blender until very smooth. Stir in cool caramel sauce and chill completely. Once chilled, freeze in an ice cream maker according to manufacturer’s directions. 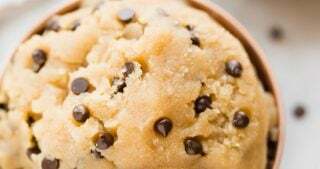 Place chocolate chips in a medium microwave-safe bowl. Microwave 1 minute then stir very well. Continue microwaving in 30-second bursts, stirring completely between bursts, until chocolate is melted. 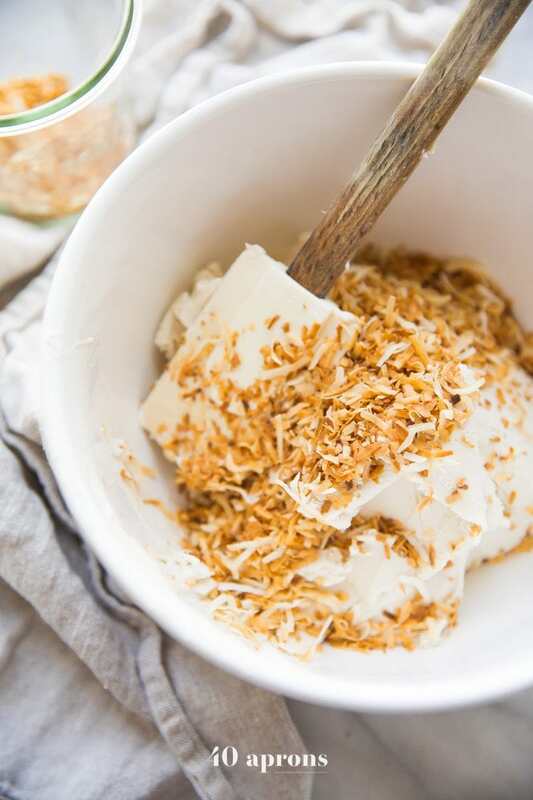 Stir in coconut cream until melted and smooth. If your fudge looks a bit grainy, that’s OK. If you have a high-speed blender like a Vitamix, you don't necessarily need to soak your cashews.